Iraqi tribal chiefs in the so-called Sunni Triangle have agreed to join forces to fight al-Qaeda, and have pleaded for US supplies of arms. 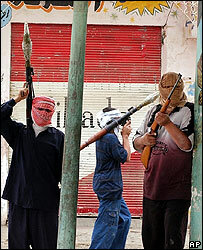 One leader said tribes in the city of Ramadi had assembled 20,000 men "ready to purge the city of these infidels". 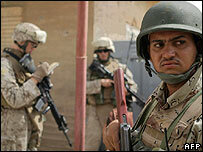 Ramadi, in Anbar province, is one of the cities at the heart of the Sunni rebellion against US troops and Iraqis. At least 33 people were killed in two bomb attacks in Iraq on Monday, police said, including 13 in Ramadi. According to one report, a suicide bomber attacked volunteers who were queuing up at an Iraqi police recruitment centre in the city. Meanwhile, in the northern city of Talafar, at least 20 people died when a suicide bomber blew himself up in a busy market just before dark. Fourteen bodies were found in different parts of Baghdad, showing signs of torture and bullet wounds to the head, the interior ministry said. Tribal leaders and clerics in Ramadi met last week to decide how to confront the daily bloodshed in their city. "People are fed up with the acts of those criminals who take Islam as a cover for their crimes," Sheik Fassal al-Guood told the Associated Press news agency on Monday. "The situation in the province is unbearable, the city is abandoned, most of the families have fled the city and all services are poor." He said 15 of the 18 tribes in Ramadi "have sworn to fight those who are killing Sunnis and Shiites", and had put together "20,000 young men". Another sheikh at the meeting, Sattar al-Buzayi, told Reuters that the tribal leaders had decided to take the fight to the Islamist militants who control parts of Ramadi and Anbar province. "We have now entered a real battle. It's either us or them," he said. "We just want to live like everyone else. We're sick of all this bloodshed," said one Ramadi resident, voicing anger at al-Qaeda. However, a young al-Qaeda leader called Abu Farouq told Reuters that the fight would go on until an Islamic caliphate had been imposed across Anbar. "This tribal system is un-Islamic. We are proud to kill tribal leaders who are helping the Americans," he said. Nonetheless, a US military spokesman, Maj Gen William Caldwell, said: "We're very optimistic about the future of that province." "But victory will not occur in the next 2-3 months, it's going to be a much longer time period." Meanwhile, the trial of former Iraqi leader Saddam Hussein has resumed in Baghdad. A former Kurdish rebel told the court that he still lived in "pain and suffering" after his village was bombed with chemical gas by Iraqi forces in 1988. He said the attack left him unconscious for weeks and temporarily blind, and that it killed many people in his village.